Do you ever buy something, then completely forgot you have it? That's how the story goes with me and the coveted Laura Mercier Body & Bath Crème Brulee Duet. A set which comes around every Christmas, and one beauty bloggers and adorers alike rush to snap up in the Boxing Day and January sales. This year, I was one of those girls, desperate to get my hands on a set of products which are regularly hailed as the best of the best, extravagant and luxurious, unlike anything else. So I snapped them up in the Space NK sale, for £15, half the usual price. They came, I put them away ready for moving and then I forgot they existed. It was only when unpacking a final hidden away box recently, that I remembered I had even bought them. A big sign I have too many products.... but the perfect products to indulge in for my mid-week pamper. 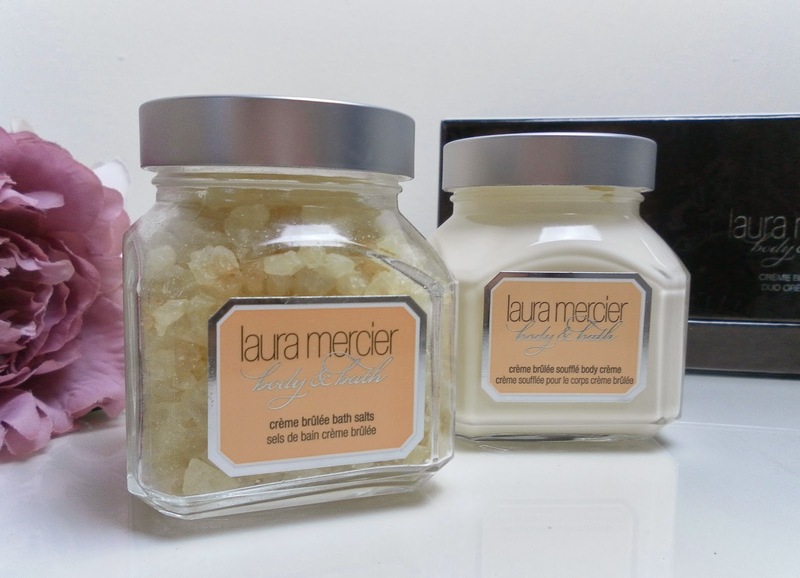 The duet contains two products from the Laura Mercier Creme Brulee range, one of the most popular scent ranges on offer; a 150g Creme Brulee Bath Salts and a 150ml Creme Brulee Souffle Body Creme. Usually Laura Mercier bath and body products are double the size to buy individually, but the set itself is very generously sized and even at the full price, would have been a luxurious yet affordable buy. The bath salts don't seem to be available to buy individually and only available as part of the set, which is a shame as they are incredibly beautiful and it would be lovely to see bath salts extended into the different scent ranges on offer from Laura Mercier. A scoop of salts poured under running water and the delicious scent of Creme Brulee fills the bathroom, it's a very delicious scent and one I'm not sure many could resist. Doubling up as a multi-purpose product, when moistened, they can also be used as an exfoliant, which I will be giving a try next time I decide to have an extravagant bath. Thankfully, the truly incredible Creme Brulee Souffle Body Creme (HouseofFraser, 300g, £44.50) is part of the permanent bath and body range and boy, does it live up to the hype. Suitable for all skin types, this luxurious body creme works to moisturise and hydrate, with a scent inspired by Laura Mercier's childhood memories of French patisseries. With an ultra-whipped formula and a scent which will have you craving a real, tasty creme brulee in seconds, it's light-weight and sinks into the skin effortlessly. Afterwards? My skin feels so, so incredibly soft. Of course, the full size has quite the price tag, so this will be reserved for special occasions and times when pampering needs to be that little bit more luxurious. But honestly? I'm smitten.